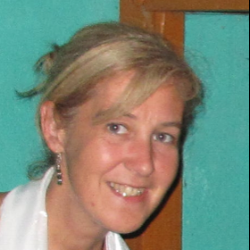 Based in Italy Maria started working as an education and then a clinical pedagogist. She became interested in Buddhism and the Dalai Lama's Mind & Life Institute, bringing together scientific with contemplative practice and wisdom traditions. Maria is an accredited 16G Level 1 facilitator. Maria delivers workshops in Italian. I’ve been working in a social co-operative with disadvantaged children since 1990, first as a professional educator, then as a clinical pedagogist. In the early years of my work I discovered Carl Rogers’ theories. All services that the cooperative manages, both pedagogical education and clinical pedagogy are based on the positive relation, and all the people that we follow are considered leaders in their own growth. In 2002 the co-operative founded the Psychopedagogical and Clinical Pedagogical Center. So, I felt the need to look for practical tools to help these people in their growth path. I found them in a Masters in Clinic Pedagogy (“Discovery Project”; “Body work”; Design Dream”, “Holistic Psychodrama”). I felt that something was still missing. Then, I met Buddhism and my Spiritual Master, Khube Rinpoche (Karuna Home’s Director). I started to collaborate with Karuna Home (a center, in South India where the physically and/or mentally disabled can receive special education and care). So, after that time, I’ve been practicing contemplative and analytical meditation steadily. This has helped me to face life’s problems in a different and more satisfactory way. Then I have started to try to integrate the techniques of clinical pedagogy with some contemplative practices in an completely empirical and intuitive manner. I met Mind and Life Institute and with my colleague in October 2009 went to Washington D.C. for the conference. At that time we collected a lot of interesting stimuli. In April 2010 we went to Zurich for the conference of Mind and Life. In September 2017 I went to Pisa for the conference Mind and Life. We believe that the future of education should go in that direction. We like to consider the person in their complexity helping to integrate the various aspects of his/her life in a holistic vision (body, brain and mind). I think that the 16G course would be an excellent opportunity for me to integrate both on a personal and professional level.